Chinese Box Jasmine was planted by my uncle in his farm and this cute, small tree would be covered with white fragrant flowers attracting everyone towards it. 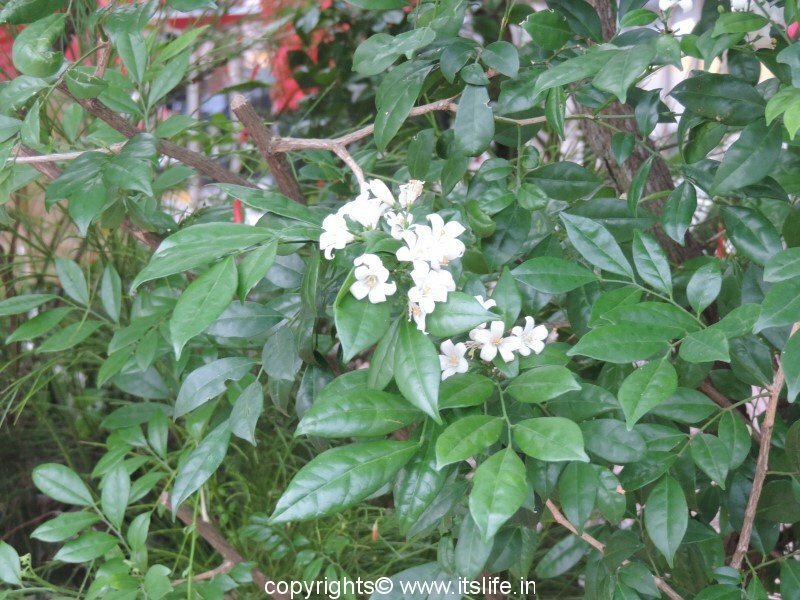 Orange Jasmine, Orange jessamine, Chinese box, Mock orange, Mock lime, Satinwood or Lakeview Jasmine are the other common names of Chinese Box Jasmine. In Kannada it is known as Kadu Karibevu and China Malligi, Marathi it is known as Kunti, Manipuri it is known as Kamini. 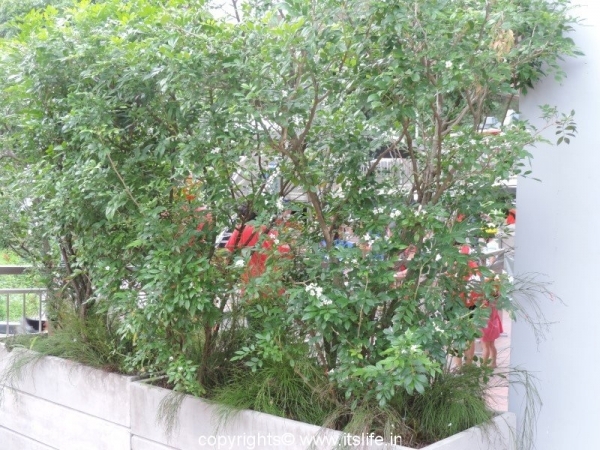 The plant is native to South Asia, Southeast Asia and China. 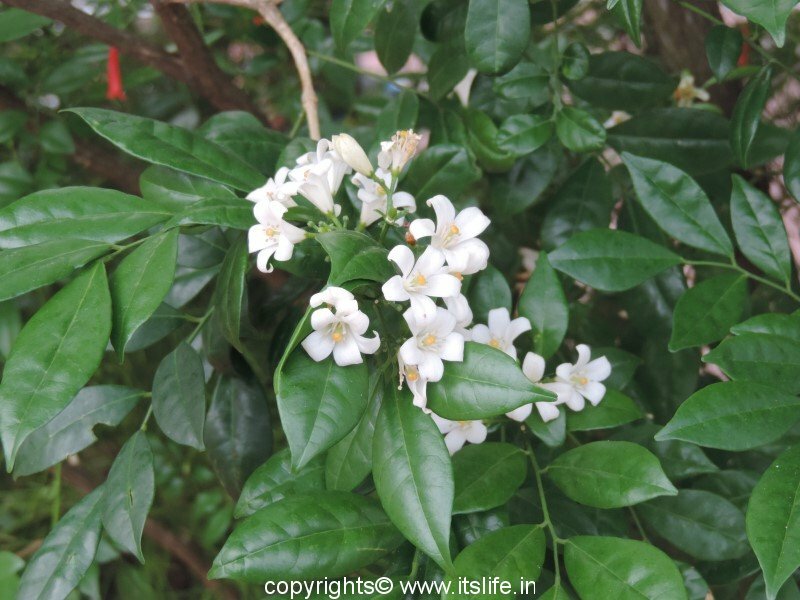 Botanical name is Murraya paniculata and belongs to Rutaceae (citrus) family. The tropical evergreen tree grows to a height of 7 meters. The tree can be pruned for the trunk to branch and planted next to one another to form a hedge. The leaves are dark green, pointed, arranged alternately around the stem. The flowers bloom throughout the year at the end of all the branches. They are small, cream, and fragrant. Petals are 12–18 mm long. The fruit is oval, reddish orange, and is 1 inch in length. The flowers attract bees and the fruits attract small birds like flower pecker, sun bird, or common tailor bird. The plant is propagated by seeds. Chinese Box Jasmine leaves and roots are used in traditional medicine to treat various ailments.